Push your boundaries and discover how wet, exciting and wild North Devon can truly be. Watersports in North Devon are becoming increasingly popular with visitors aiming to get their water fix! North Devon is traditionally known for being one of the top hot spots for surfing in Croyde but there are various other water sports to explore here. Experience the thrill of open water diving, fly along the water in a speedy dinghy, stand up paddle boarding. North Devon offers some of the UK's best year-round water sports all set in stunning locations of the coast line. If competing against family members or a group of friends inspires you try the adrenalin pumping magical thrill of The total wipeout in Devon, this was inspired by ITV's series "Total Wipeout" where the aim of the game was to complete a grulling and tiresome assult course in the best time. But if the thought of jumping over "big red balls" is too much excitement for your relaxed holiday then North Devon offers more relaxed and sedate watersport activities such as boating, canoeing and cruises to the spectacular Lundy island from Bideford to enjoy a more laid back water themed based holiday. Learn to waterski, wakeboard and surfing in Croyde with Point Breaks on the beautiful Taw and Torridge Estuary. We can train boarders and skiers with a range of abilities. All equipment is provided, including buoyancy aids, very warm wetsuits, waterskis, mono-skis and wakeboards for every level of ability. We have kid's waterskis, mono-skis and wakeboards with quality bindings - everything you need to learn the right way first time. Minimum aged around 11 years old. Point breaks also offer surfing in Croyde and are a trained North Devon surf school. Fancy being dragged behind our super-fast Piranha Sunburst speed boat? Enjoy the thrills and spills of our ever-popular Super Screamer ride! Non-wakeboarders and waterskiers can try the Super Screamer or one of our other ski boat rides - awesome fun and more extreme than you might think. Screaming guaranteed! Go on, challenge the driver and see if you can stay on! 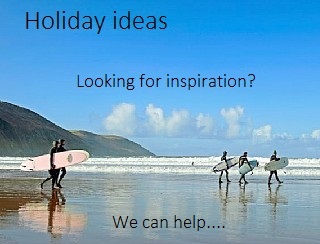 Point breaks are also a North Devon surf school so why not try surfing in Croyde as well. Coasteering is a mixture of scrambling and climbing around cliffs, through hidden sea caves, traversing rocky outcrops, swimming through ocean carved channels and jumping off headlands into sea pools and gullies, all the time being toyed with by the ocean swells. Coasteering with Point Breaks is an exhilarating sport that explores the stunning North Devon coast. Coasteering can be as challenging as you want it to be, some of our jumps are only six foot high and others are over 20 feet but none are compulsory therefore you can choose whether you just want to have a scramble around the coastline, or face your fear as you gaze over a vertical drop that will make you think at least twice. Stand up paddleboarding (SUP), is an ancient form of surfing originating in Polynesia. More recently it has been growing in popularity as a fun and accessible way to enjoy both the surf and flat water. An SUP is like an oversized surfboard that you stand on from the start and hold a single bladed paddle to move yourself forwards. It's easier to learn than surfing because you start by standing up and the boards are big and stable. We offer numerous lifeguard assisted tours, super-chilled-out experiences for families or Stags on Sunday mornings! For those up for a challenge we can take you out into the surf to ride some serious waves. A classic and good fun half day challenge! With basic parts and lots of rope, your group will compete against each other to build the ultimate raft. Try your hand at Kayaking, Canoeing or both! These are both great activities for young people to master and are both great fun! Participants can try their hand at paddling a kayak on their own, or getting a team together to try and master the art of getting a canoe to go in a straight line. One thing is for sure, everyone will get WET!!! Rock & Rapid centre in North Devon can cater for surfing enthusiasts..... You could try your hand at the new SUP experience (Stand up paddleboarding) or even coasteering but which ever you choose be prepared to get wet and wild! North Devons only British Kitesurfing Association Approved School covering Westward Ho!, Saunton and Woolacombe beaches.all year round by arrangement and at a time to suit. Beginner, advanced beginner and intermediate kitesurfing lessons to meet your requirements. The total wipeout course UK is designed with a range of action packed water and land based obstacles to challenge and test all ages and abilities. Take on the High, the assult with its wipeout balls, surfing, coasteering and even zorbing! can your adrenaline levels take it!? Located in the stunning landscape of North Devon and only 10 minutes away from the coast, North Devon Wake Park boasts the best of both worlds. Offering you a stunning lake with all the trimmings. Cable Wakeboarding is similar to skateboarding and snowboarding, accept your feet are strapped in and it is on water. Also, you hold onto a handle so that an overhead cable can pull you along.